Editor’s note: This word study comes to us from longtime LCMS missionary David Schneider. In 35 years of foreign mission service in five different countries, his work was evenly divided between serving as local pastor and seminary teacher. He received Concordia Seminary’s Distinguished Alumnus Award in May 2013. 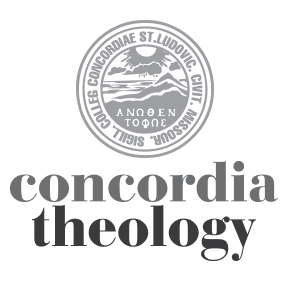 This article is based on his small-group presentation during Concordia Seminary’s Theological Symposium in 2015. Edmund Schlink, in his Theology of the Lutheran Confessions, examines all the Lutheran confessional documents to distill and express their unifying theology. As an extra benefit, he attaches an Appendix, to list important scriptural themes that the Confessions do not discuss. In this paper I aim to develop several of those undiscussed topics—particularly important aspects of Holy Baptism. Schlink had already mentioned that the three confessions overlook the eis ton thanaton (“into the death”) teachings of Romans 6:1–11, thus omitting the clear gospel connection that those verses establish between baptism and the saving death and resurrection of Christ. It is my intention to follow Schlink’s (unspoken) suggestion that these biblical themes be discussed in the church for the inspiration, comfort, and encouragement of all its members. So now we come to the main point of this study. The Greek text of Matthew 28:19 may be translated “by means of baptizing them into (eis) the name of the Father and of the Son and of the Holy Spirit.” The focus here is on the preposition eis, a common NT preposition that normally expresses the idea of motion or movement into something or someone. In that reference, it is clear that baptism eis the name of the Father and of the Son and of the Holy Spirit means “becoming the possession of” and “coming under the protection of” the Triune God—strong testimony that eis here means movement from outside to inside the very essence of God. Although that may be sufficient reason for Bible translators to use “into,” it has not been enough. Only William Beck, in his The New Testament in the Language of Today translates “into the name,” though several translations, including the ESV, provide a footnote that presents “into” as an alternative. Why do so many persist with “in”? Could it be that some of them work, perhaps unconsciously, from theological traditions that deny the saving, transforming power of baptism? What is the significance of “into” rather than “in”? Baptizing in the name suggests the picture of a pastor standing in God’s name and authority as he administers the sacrament. Not a bad picture. But the normal Greek preposition for such a picture would be the word en, which could describe the pastor’s location. The word en can also be used to denote an instrument by which something is accomplished, as in “by means of the name.” Another good idea, but the fact remains that eis, not en is the word used in v. 19. Baptized “into the name” pictures the person being transferred from outside God’s name to inside the name—God’s family—with all of the family blessings and responsibilities. Regarding the word “name,” it is good to note that, biblically speaking, a name is more than just an appellation. It involves everything that a person is and all that the person says and does. A demonstration: “You shall call his name Jesus, for he will save his people from their sins” (Matthew 2:21). Perhaps the primary example of the baptismal power of eis is found in Romans 6:3 and following where Paul asks, “Do you not know that all of us who have been baptized into (eis) Christ Jesus were baptized into (eis) his death?” And a moment later, “We were buried therefore with him by baptism into (eis) death.” He immediately adds the idea of Christ’s resurrection, and we are impressed with the power of the baptismal eis. By it we enter into Christ’s dying and rising and the great blessings: forgiveness, justification, faith, joy, confidence, a peaceful death, resurrection, and eternal life! These verses augment and enrich the baptismal theology given in Matthew 28:19. The idea of eis (into) a name comes through clearly also in 1 Corinthians 1, where some Corinthian Christians are lining up behind different spiritual leaders: Paul, Apollos, Cephas, even Christ. In 1:13, Paul asks them, “Were you baptized into (eis) the name of Paul?” His meaning is clear. Paul is appalled at the idea that any of the Corinthian Christians would see himself as their lord. He knows the importance of eis. A few NT passages speak of baptism using prepositions other than eis. Acts 2:38 has epi (in, with, by) the name of Jesus Christ. And in Acts 10:48 Peter directs that the new Gentile believers be baptized en (in or by) the name of Jesus Christ. What is the practical value of saying “into the name . . .” rather than “in the name . . .”? The use of eis (into) the name of God (Matthew 28) and eis (into) the death and resurrection of our Lord (Romans 6) is the gospel of salvation for the whole world. It produces a concept that lifts Holy Baptism far above the idea that baptism is only obedience to an ordinance of Christ. If the conclusions of this study are valid, the church might consider amending the rite of Holy Baptism by having the officiant say “I baptize you into the name of the Father and of the Son and of the Holy Spirit.” Can we talk about it? Edmund Schlink, Theology of the Lutheran Confessions (Minneapolis: Fortress Press, 1961), 303. William F. Arndt and F. Wilbur Gingrich, A Greek-English Lexicon of the New Testament (Chicago: University of Chicago Press, 1957), under “eis to onoma,” 575. William F. Beck, trans., The New Testament in the Language of Today (St. Louis: Concordia Publishing House, 1963), 60. Well done David! I have taught this for decades. Glad to have your learned support. You have been my hero since Camp Pioneer! Given the seriousness of the argument regarding Acts 2:38 versus Matthew 28:19 (the theological implications of Trinitarian vs. Modalist understanding of the Divine Being), what is the significance of EPI in Acts 2:38? What is being said by baptismal passages in Acts that seem to go in a different direction from Matt 28:19, and how do we show the legitimacy of Matt 28:19 as a liturgical frame by which the Church has historically fulfilled Christ’s command to disciple, baptizing?